Goalposts used to be in the front of the end zone. The front. On the goal line. From 1933 to 1974 this is the way football was played, as an obstacle course. Then they rethought it. Players stopped running into the goal posts, scoring increased, and the game became the most popular sport in the country. 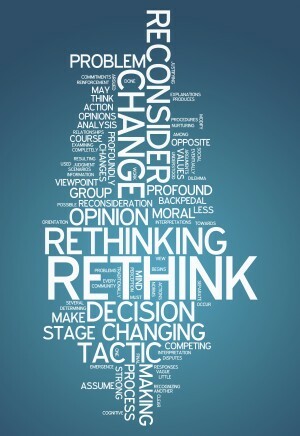 However, not everyone takes the opportunity to “rethink”. Do you remember going to Blockbuster Video to pick up the latest movie? Chances are that you do. Did you know that Blockbuster was given an opportunity to buy NetFlix in 2000? They were, for $50 million. However, as history has shown, they passed on the deal. They thought that their model: the brick and mortar, please be kind, rewind, and late fee charging model would always work. They didn’t “rethink”. Today NetFlix is a $32.9 billion company, and Blockbuster went out of business in 2013. The moral of these stories is that just because you’ve always done something doesn’t mean there isn’t a better, easier, more efficient way to do them. It can be something as significant as buying NetFlix, or something as common as getting your hair cut somewhere new. Often times when we continue down the familiar road, we miss new scenery. This shouldn’t be the case when it comes to your business. Especially when it comes to technology. Of course there’s the old adage, “if it ain’t broke, don’t fix it”. But how do you know it’s not “broke”? More often than not relationships are forged and new projects appear to be comfortable as the same people do them the same way. Whether it’s a networking implementation that kind of works, or installing new hardware that is being underutilized, or automation that isn’t really automated; the time has come to rethink technology. Commercial audio/visual integration is becoming a more powerful and necessary element for businesses of all shapes and sizes. The needs of companies and capabilities of equipment and design have far exceeded hooking up a telephone and hanging a flat screen on the wall. This is why Link Integration Group is helping businesses across Louisiana “rethink technology”. Link Integration has made it their mission to provide the best designs, platforms, installation, and integration for your boardroom, work space, and facilities to make your meetings, work, and company better.